Black bear photo © Roy Mac on Flickr (all rights reserved; used by permission). 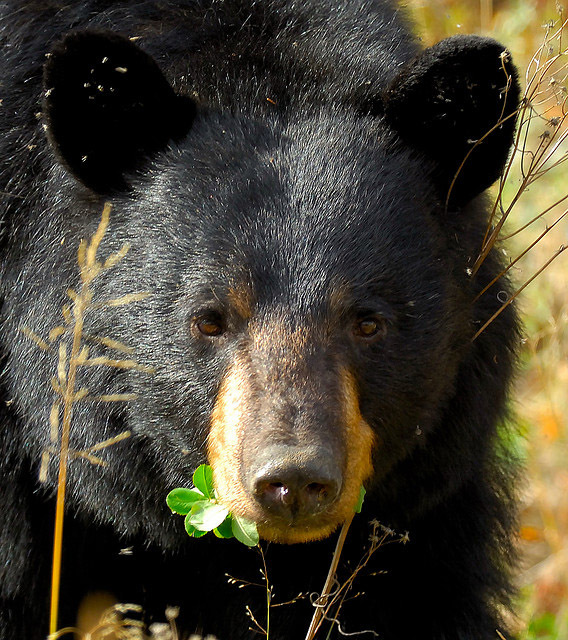 A black bear's head is the symbol of the New Mexico Department of Game and Fish. Smokey Bear (selected by the U.S. Forest Service as spokesman and symbol for fire prevention) was found as a cub cowering in an injured tree after a 17,000 acre forest fire in the Lincoln National Forest near Capitan. Smokey is buried in Smokey Bear State Park in Capitan, New Mexico. Black bears are very intelligent, shy, and secretive animals - actually seeing a bear in the wild is a very rare experience. Black bears (Ursus americanus) are not always black - there are also cinnamon, white, beige, and "blue" (slate gray) black bears. Adult black bears vary considerably in size, from 130 - 500 pounds (occasionally as much as 700). The black bear is omnivorous and will eat just about anything. While they prefer nuts, berries, grasses, and roots, they also eat insects and small mammals, and if nothing else is available, carrion. 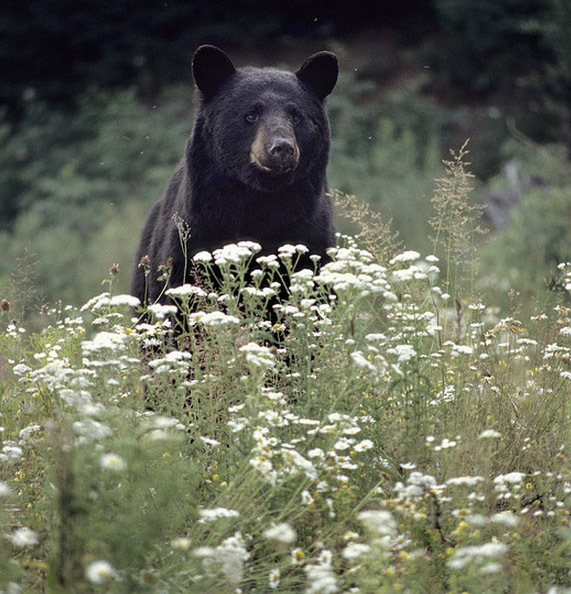 The black bear ranges from the far north (Alaska and northern Canada) to northern Mexico. They can run up to 30 mph and are good swimmers (photo of black bear swimming). The black bear is a solitary creature (except females with cubs). A mating pair may stay together for one to several days, then part ways. The cubs are born in the winter during hibernation, and will remain with their mother until their second summer. When they emerge from the winter den the mother teaches the cubs which plants to eat and where to find the grubs and other insects that will supplement their diets. Black bear (Ursus americanus); photo © Jerry DeBoer on Flickr (all rights reserved; used by permission).